I was hungry for some cookies but after paging through countless recipes I still was undecided as to which recipe to make. I wanted to bake up something simple, that tasted great and used up ingredients I already had on hand. Not having much time to bake, I did not want a recipe that was too labor intensive today, rather I needed a quick recipe that I could whip up and chill until I had to bake the cookies later. I was so impressed by the results of my Cream Cheese Chocolate Chip Cookie recipe that I decided to play around with it a bit. I really liked the chewiness and richness that the cream cheese added to my traditional cookie recipe, the changes in taste and texture were subtle yet noticable. After diggin in my freezer, I decided that this would be the perfect time to use up my bag of coconut in some cookies. I am very pleased with the results. These baked up rich and flavorful with a wonderful coconut flavor. They kept their shape well with a slightly crisp exterior that gives way to a soft and chewy interior. I highly recommend chilling the dough at least 30 minutes. The incorporation of cream cheese in the dough keeps it very soft unless chilled which will lead to cookies that spread while baking and thus resulting in thinner and possibly crisper cookies. If that is your thing then feel free to experiment with chilled vs. unchilled dough. Next time I will add some toasted pecans and toffee pieces to the dough. I think that those ingredients will push these over the edge into greatness! I can’t wait to make these again. *I chilled the dough overnight before baking, which I recommend. Adjust oven racks to upper & lower -middle positions & heat oven to 325. Line a large rimmed baking sheet with parchment paper. Spread coconut evenly on baking sheet. Once oven is preheated place coconut in oven. Bake for 10-20 minutes stirring every 5 minutes for even toasting. Remove from oven when light brown. Do NOT burn. Remove from oven. Allow to cool completely before adding to dough. Re-line cookie sheets with parchment paper. Whisk dry ingredients together; set aside.With electric mixer, or by hand. Mix butter and cream cheese together with a mixer until smooth. Add sugars and beat until thoroughly combined. Beat in vanilla until combined. Drop dough onto parchment lined baking sheets and bake for 12-14 minutes or until edges are set and bottoms are light brown. Do NOT overbake! I love the flavor of coconut, it really says “summer” to me. With the season half over already, I decided to whip up a cookie that would let coconut be the star of the show. I decided to try a new recipe and was very pleased with the results. 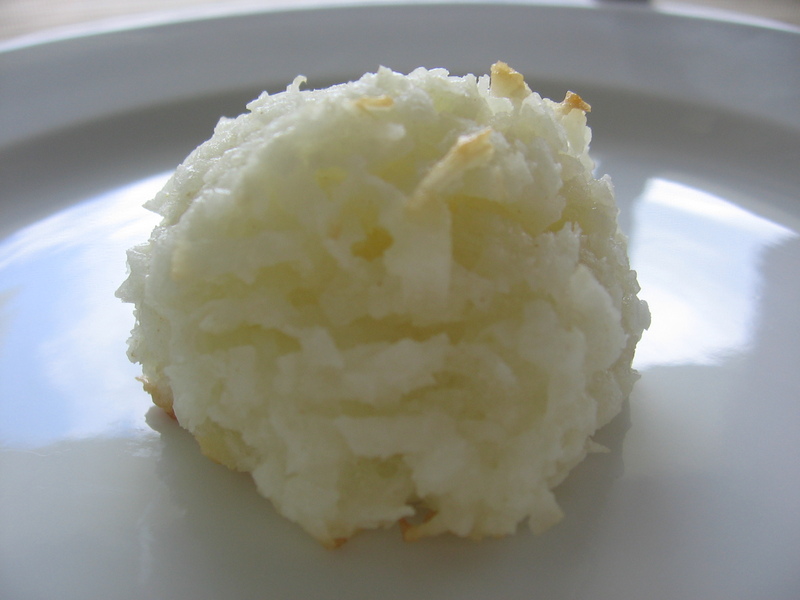 Macaroons are quick and easy and require very few ingredients. They make a great dessert when you are looking for something light and non-chocolatey but are sick of fruit. An added bonus is that there is no added fat other than what is in the coconut! You can eat these and feel good about your diet (just don’t eat too many). I have used this recipe in the past but like I said, I was in the mood to try a new recipe. While I enjoy the version using sweetened condensed milk, I find them to be very moist and almost gummy (but still yummy). I found this recipe in an old Pillsbury cookbook, tweaked the preparation method a bit and am pleased with the results. The dough is moist but holds its shape well, especially after a brief 30 minute rest in the fridge. The delicate texture of the dough is a product of pulsing the coconut in a food processor before adding to the recipe. This method was not called for in the original recipe but I feel helps produce a cookie with great texture and consistency. 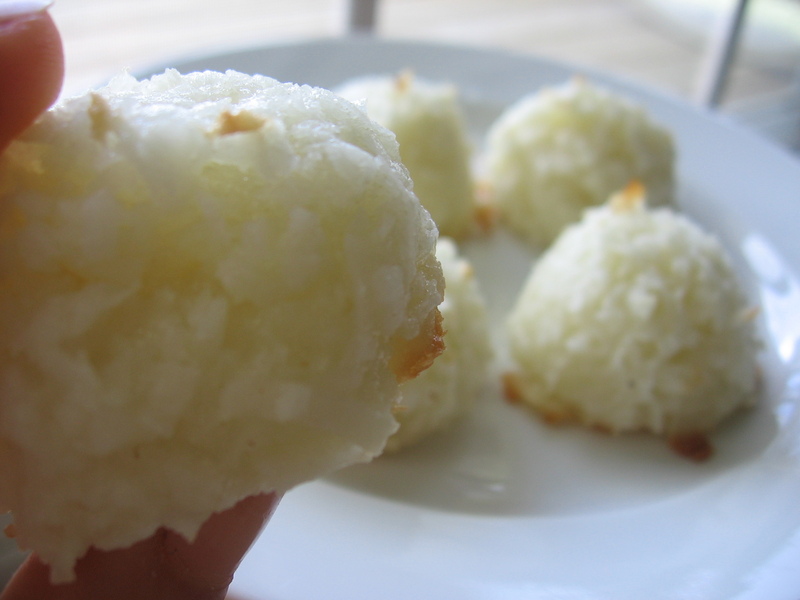 The smaller pieces of coconut produce a dough that holds together well and a cookie with a light but solid interior with no long strands of coconut sticking out of them (which can be somewhat difficult to chew). Chilling the dough for 30 mintues before baking also helps the cookies keep their shape during baking as well as softens the coconut for better texture and flavor of the baked cookie. 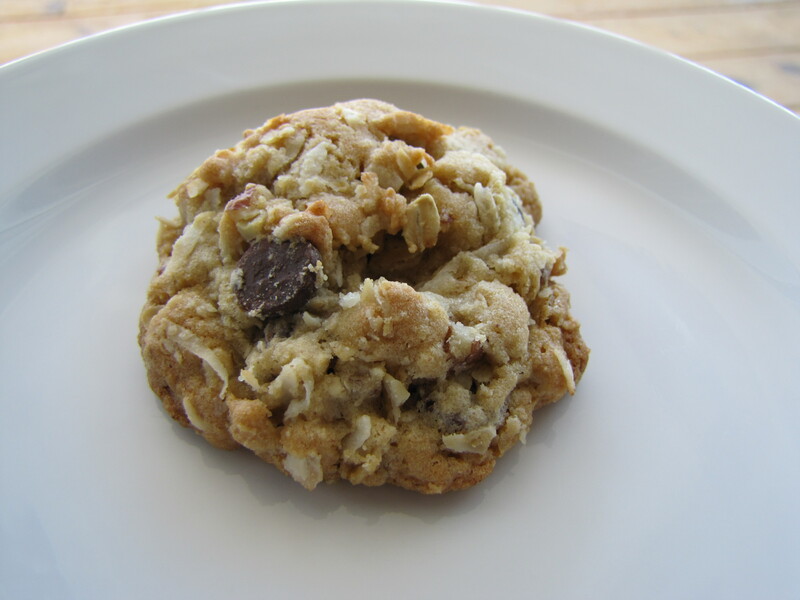 The exterior of the cookie has a slight cripness from the browned coconut. However, next time I will bake a tad longer in order for the coconut to brown a bit more. These were not underbaked but another minute or two wouldn’t have hurt. Just watch closely because they can go from light brown to burn pretty fast. 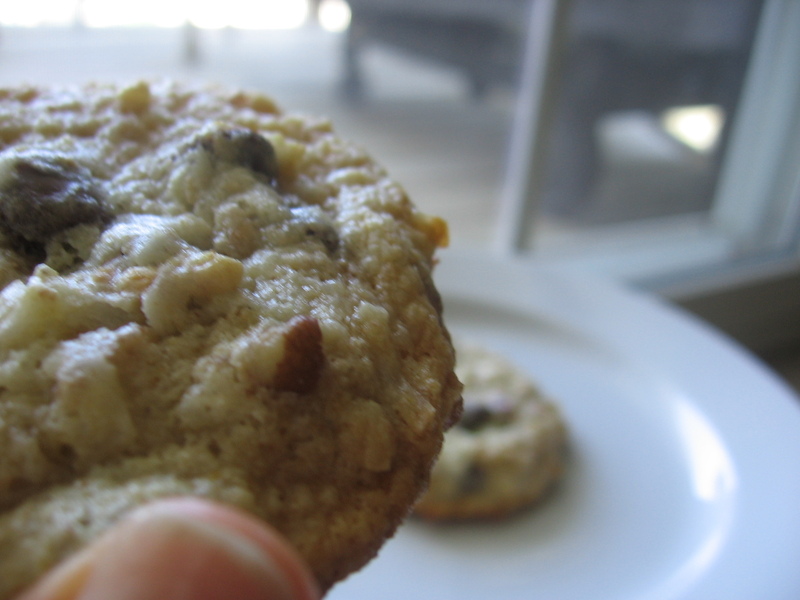 The interior of these cookies is flavorful and moist but not overly gooey. These were very good. 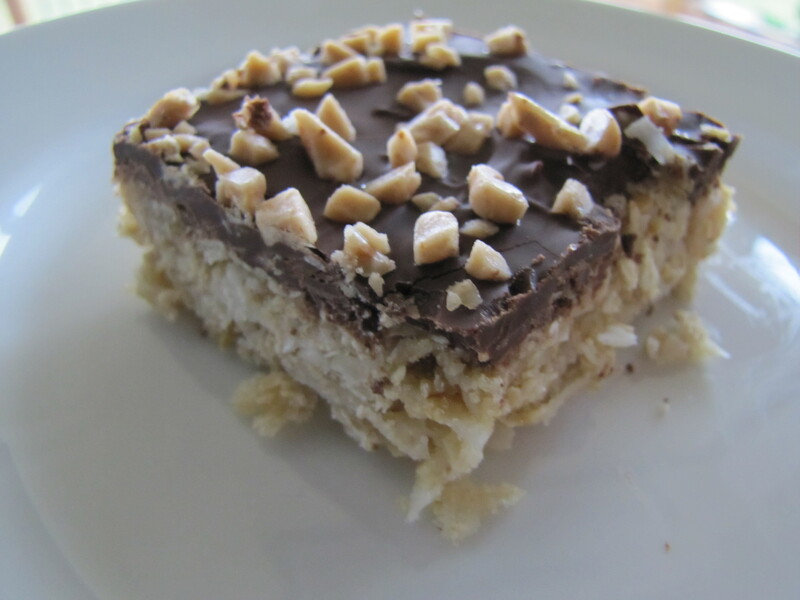 Next time I may add some chopped pecans or almonds to the dough or drizzle melted chocolate over some of them after they have finished baking because I love the combination of coconut and chocolate. Heck I may even dip some baked cookies into melted chocolate and sprinkle with nuts if I am in a feisty mood. ha ha. Bring eggs to room temperature by letting them sit on the counter for about an hour before separating (this will make it easier to separate). In a food processor pulse the coconut 1/2 cup at a time for 15-30 seconds. Transfer to a bowl. Place the egg whites in a medium bowl and starting at low speed, beat the egg whites until they begin to foam. As the foam continues to build, you can turn the speed to medium and then high. Beat until the foam forms stiff, glossy peaks. Add the Vanilla or Almond extract as desired. Add the sugar, flour and salt and continue to beat until incorporated. Fold in the coconut just untili combined. Cover bowl tightly and chill for 30 minutes. Spoon the batter onto the pan in rounded mounds. The batter should be of a consistency that a spoonful will stand as a mound 3/4-inch high on the pan. Bake for 15-18 minutes or until the cookies begin to turn a light brown color. Immediately remove the cookies and allow to cool on wire racks. Store in cool dry place. I love coconut, almost as much as I love Peanut Butter. 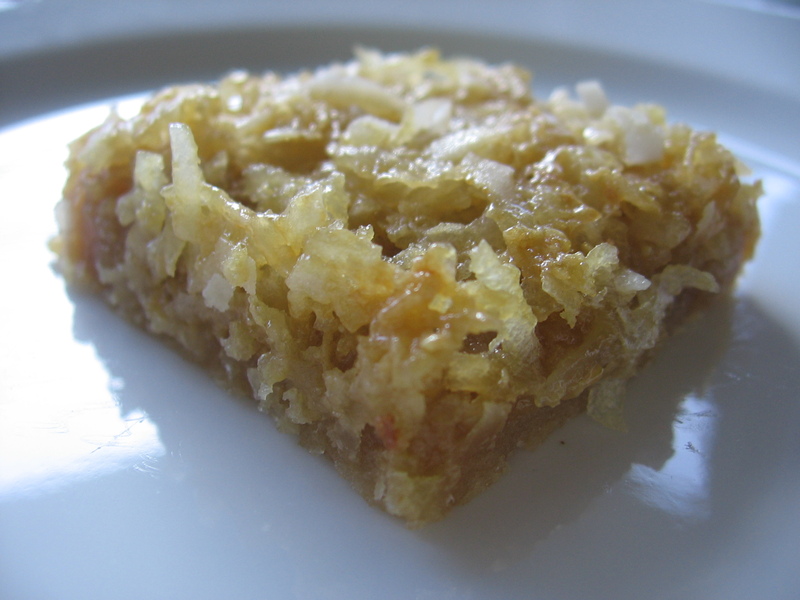 I like how coconut provides a depth of flavor and hearty texture to baked goods. 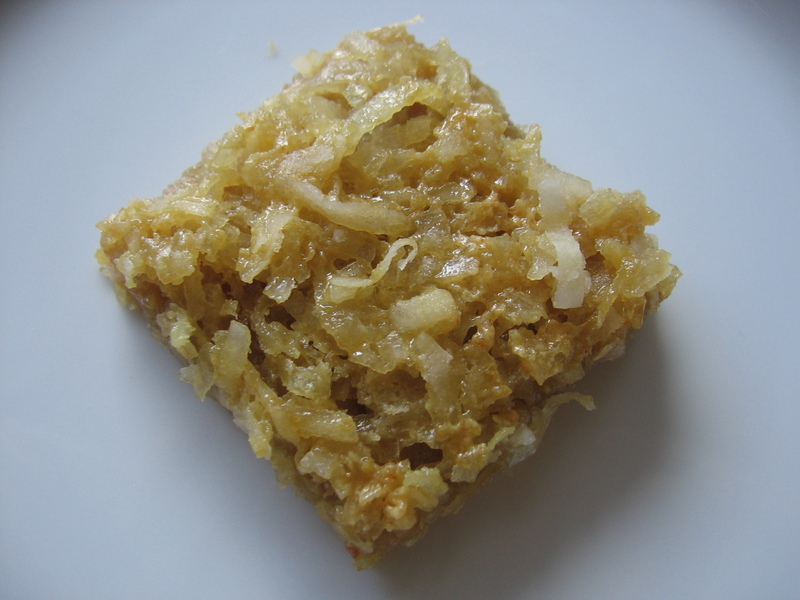 The picture may look familiar to those who frequent my blog, but I assure you these are new, but very similar to the Blonde Magic bars I made a while ago. I whipped these up Saturday night as I was asked to make a dessert for a friend’s wedding shower this past weekend. Knowing she loves everything coconut I decided to try a recipe I have had saved for quite a while. A warning however, these bars are really really sweet so you may want to reduce some of the sugar in the filling if you are adding a fairl amount of chocolate or candy. After tasting these I wonder how a little lemon/lime juice in the coconut topping (along with some toasted pecans) would have been, I may try that the next time if I don’t add chocolate or candy. Needless to say, my friend loved these bars and I enjoyed them as well. What I enjoyed the most about these bars, however, was the brown sugar shortbread like crust. It was so yummy and light and a welcomed change from the usual graham cracker crust of the other dessert bars at the shower. I felt the ratio of crust to topping was too small and not sturdy enough for the topping unless the bars were cut small (maybe not a bad things since they were so sweet, but with the addition of chips/candy/nuts I don’t know if they would have held up even cut small). Next time I think I will make 1 1/2 times the crust mixture and bake a few minutes longer before adding the coconut topping which may pair down the sweetness of the coconut mixture, especially if adding chips or candy. All in all, a good recipe that can get better with a few tweaks so feel free to make them your own. I am excited to play around with the recipe a bit because I think it has potential to be a quick go-to versitile dessert. Line a 9×13 pan with foil. Spray lightly with PAM. Using low speed on mixer, combine flour, 1/2 cup of the brown sugar and butter until mixture resembles sand. Using lightly greased finger tips, press the mixture into bottom of prepared pan. Bake for 15 minutes. While crust is baking, mix together the remaining brown sugar with eggs until just blended. Remove crust from oven when time is up and evenly spread coconut mixture over partially baked crust. What is a treasure? In my mind it is something surprising and good. I am not sure how these cookies got there name, it may be because they have a unique texture and surprising ingredients. However they got their name, they deliver a tastey treat that may not be as good as gold, but is GOOD none the less. What makes these cookies unique is that they are egg-free and the base of the dough is made from crushed Graham Crackers and Sweet and Condensed Milk. 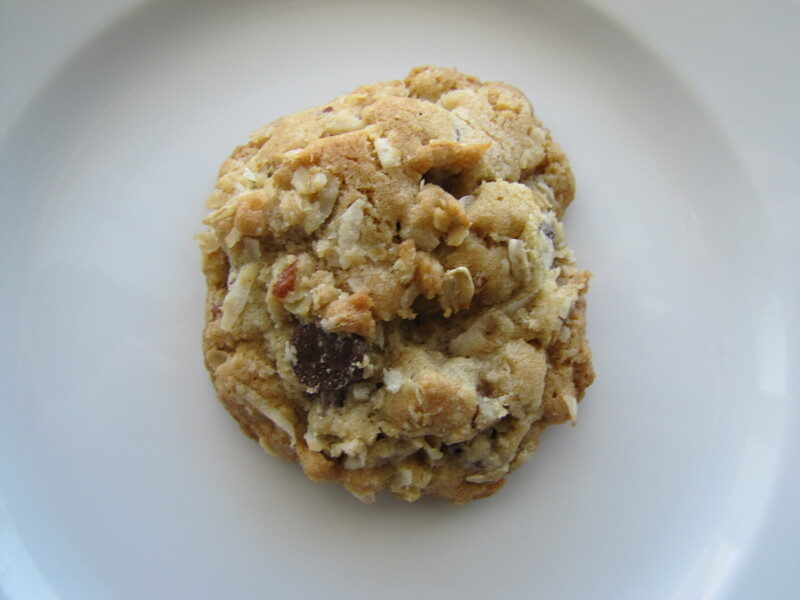 Add to that a few baking staples and some coconut, chocolate chips and nuts and you have yourself one heck of a tastey cookie. These cookies are chewy, very chewy and not cake-like in the least bit. 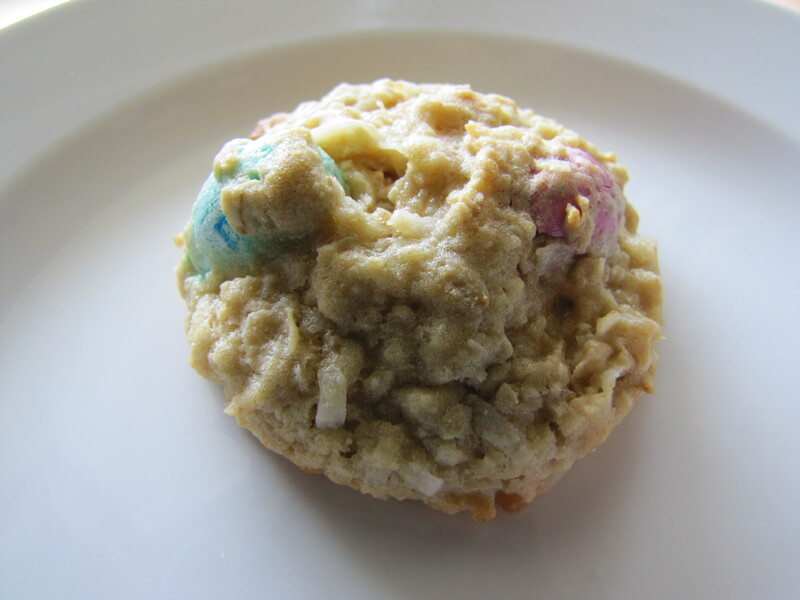 The coconut provides some depth and structure to an otherwise gooey cookie that would easily fall apart while enjoying. The Graham Cracker crumbs can be provide a subtle depth of flavor without being overpowering. While they don’t replace my favorite Chocolate Chip Cookie recipe, they do satisfy my sweet tooth and are a snap to make. These cookies are sweet, but not overly so in my opinion and offer a welcomed change of pace from the traditional cookie. In a small bowl mix cracker crumbs, flour and baking powder. In a large mixing bowl, beat condensed milk and margarine until smooth. Add cracker crumb mixture and blend well. Stir in coconut, chocolate chips, and pecans. Drop by rounded teaspoon on a cookie sheet sprayed with non-stick spray. Bake 9-10 minutes or until lightly browned.